To download, save and print my Baby My Baby Information Sheet in pdf form, Click Here! Your baby changes so much during the first year of life. With Kurt's Baby My Baby Portrait Package, you can capture all of those changes throughout the year. 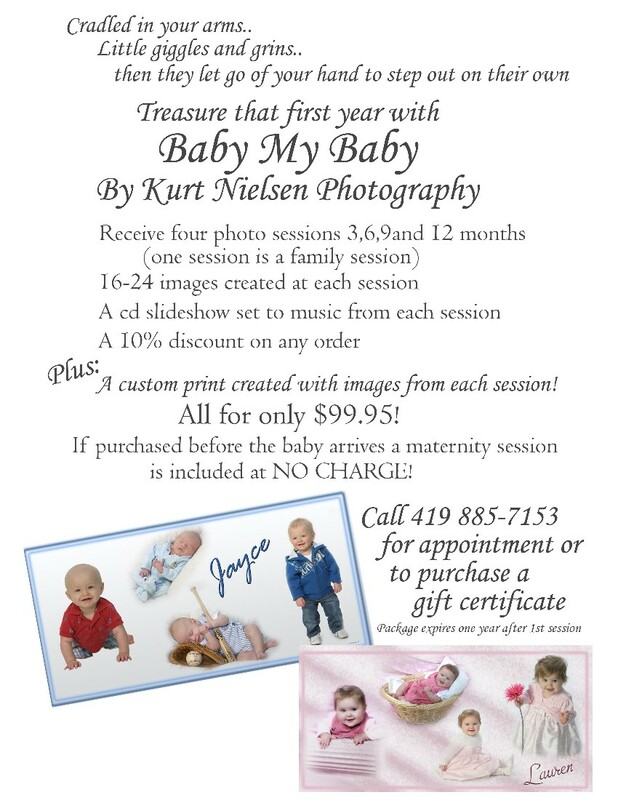 Kurt recommends photographing your child at 3 months, 6 months, 9 months and their 1st birthday. However, you can set the appointments for whatever age you wish, including newborn photos. One session must be a family photo session. Plus, if this package is purchased prior to your child being born, you can come in for a FREE maternity portrait session. You will also get 10% off of all of your portrait purchases and receive a (non-printable) CD slideshow set to music of all of the images for each photo session. This makes a great keepsake for you to treasure. After you have had all four portrait sessions, you may choose one image from each session for your FREE custom storyboard print. Kurt's Baby My Baby Plan makes a great Baby Shower or Christmas Present for any expecting mother! Ask Kurt about special pricing for in your home or on location portrait sessions!